It’s that time of year again! Lights are up everywhere, we’ve witnessed a couple of instances of snow (at least the northern section of the country), and December break is slowly but surely starting to kick in for students of all ages. 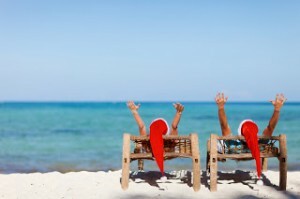 For many families, having everyone back together for the holidays plus end-of-year deadlines having just been conquered, often equals a well-deserved vacation. But while you’re lounging on a Caribbean shore, tropical drink in hand, or “shooping” down the slopes of the Poconos, there may be something far less desirable going on in your empty home. Holiday season break-ins are seemingly as common as holiday season mall traffic with vacationing families abundant along with the also common empty abodes up north vacated in favor of weathering the winter in a more agreeable southern climate. Between these two travel trends, the holidays can prove to be a lucrative season for cunning thieves who take the time to do a little neighborhood reconnaissance. While this scenario may call to mind some “Home Alone”-reminiscent antics, unfortunately, empty houses don’t usually come equipped with a forgotten child resourceful enough to booby trap every room. In order to curb would-be criminals’ penchants for breaking and entering during December, we’d like to offer you a few tips on securing your property and keeping your home safe from burglars … and from the impending stress of having to file homeowners insurance claims to replace stolen items. 1 Purchase and install a quality alarm system. Once it’s up and working, don’t hesitate to display a few window stickers or yard signs advertising its presence. Also, make sure you use it. Too many people have alarm systems and don’t activate them when they’re out of the house. It only takes a moment to set; make that moment a part of your regular routine. 2 Make sure neighbors know you’re leaving. Sometimes, a friendly neighbor is all you need to keep your home safe. If you alert the people who live next to and across from you that you’ll be out of town between certain dates, there’s a chance they’ll notice if there’s a rogue car in your driveway or unexpected lights on inside. A neighbor’s eye is by no means foolproof, but if a break-in does occur, it might be the difference between the crooks getting away or being apprehended. 4 Make a record of your belongings. By taking inventory (and photos) of your valuables, you’re creating a helpful resource in the event that your home is burglarized. It’s obviously not a fun situation to find yourself in, but your life will be significantly less stressful if you’re able to use such a list while working with a claims adjuster to ascertain what is missing and what value items have. 5 Don’t let in strangers. In the weeks and days before you leave for vacation or a winter away, make sure not to engage with strangers who may show up at your door. If a door-to-door salesperson, an exterminator offering a free termite check, or even a delivery man or woman knocks, make sure you’re on guard. Don’t award unknown people access to your home and its layout and entries. Of course, if you’re having furniture delivered and said person needs to come inside to put it down, that’s fine. Just be wary of anyone you don’t know who shows up without a good reason. There are many ways to lessen the chance of holiday crime but vacations and winter plans of all sorts shouldn’t have to be compromised in order to prevent it. By taking our advice, you’ll have to worry considerably less about the safety of your home and can then devote your thoughts to that holiday get-a-way. This entry was posted in Seasonal, Theft. Bookmark the permalink.